In this blog post, I’ll give you some background information about JDBC, explain what Mule ESB and Studio do with JDBC, and demonstrate how can you use it in a simple example. JDBC, which stands for Java Database Connectivity, is basically an API that enables users to execute operations over a Data Source using the Java programming language. This API allows you to connect to almost any Data Source system, from relational databases to spreadsheets and flat files and, using the proper SQL syntax, you can perform queries, updates, deletes, or even execute store procedures. At the very end of the line is your data source, which can be fed by any other application. Next you have the JDBC driver. As we mentioned earlier, this is the Java API interface provided by the vendor code of the Data Source that will allow Mule to connect to the Data Source and manipulate the data in it. What comes next is our Mule ESB instance, which will be the service that will be executing the Mule XML code. And finally we have Mule Studio and you. Studio gives you the framework to easily create the XML code you need and will allow you to test it by executing the code in an embedded Mule ESB instance. So by using Studio, the other layers will be transparent to you. My kingdom for a Driver! Before configuring a JDBC connection the first thing we need is the Driver. If you want to keep your kingdom you should first go to the vendor website and look for a JDBC driver file, which should be in a jar format. Keep in mind that there are some vendors, like Oracle, that may require a license to use the driver. NOTE: On www.jarvana.com you can look for the Driver class you need and download the jar file from there. In the example explained below we are going to work with a MySQL database. You can download the Driver file from here (registration required) or look for the connector class in jarvana. Open new Mule Project in Studio, and then follow these steps to get your flow working: a. Import the driver b. Create a Datasource, c. Create a Connector that uses our Datasource, and finally d. Create a simple flow that uses our connector. In the Package Explorer, right-click over the Project folder ( in this case “jdbcprj”). Look for the jar file in your hard drive and click Open. Go to the Global Elements tab and click on the Create button, which will display a new window. 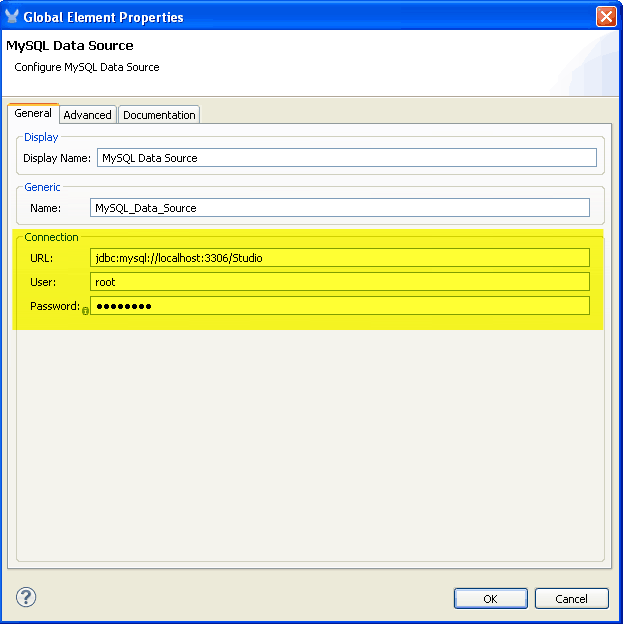 Look for Data Sources > MySQL Data Source and click the OK button. In the Data Source configuration window only 3 things are need to make this work: the database name in the URL, the User and the Password. Enter those attributes according to your database configuration and click OK.
Now that we have the datasource with its driver we need a Connector. 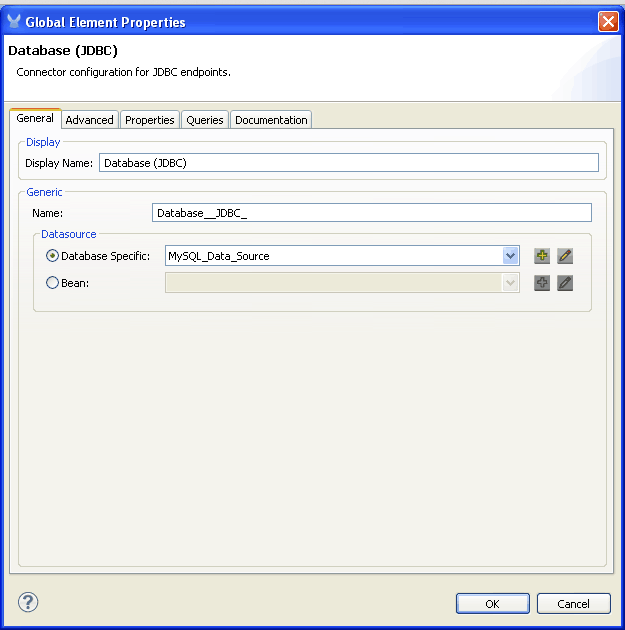 From the Global Elements tab, click on Create and look for Connector > Database (JDBC). Then click OK. The only thing that we need to do here is tell the connector which datasource to use. To do this click on the ‘Database Specific’ drop-down list and look for our datasource created in the previous step. Then click OK.
Optionally, you can go to the Queries tab now and create the queries or SQL statements that you want. If you don’t do this now you will have to do it when configuring an endpoint. 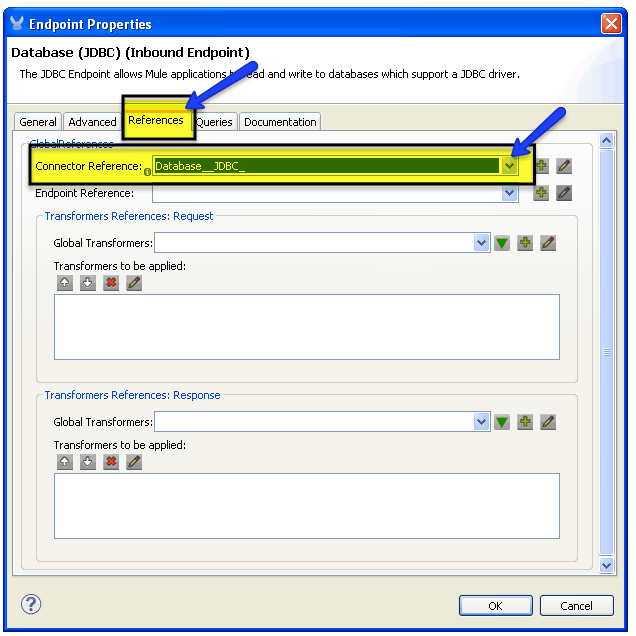 Go to the reference tab and in the connector drop-down list, look for the JDBC connector created in the step C. We are telling the endpoint how to connect to the data source by specifying a reference to a connector. The connector configuration is something global so it can be reused in any amount of endpoints that you want. <mule xmlns="http://www.mulesoft.org/schema/mule/core" xmlns:mulexml="http://www.mulesoft.org/schema/mule/xml" xmlns:file="http://www.mulesoft.org/schema/mule/file" xmlns:jdbc="http://www.mulesoft.org/schema/mule/jdbc" xmlns:doc="http://www.mulesoft.org/schema/mule/documentation" xmlns:spring="http://www.springframework.org/schema/beans" xmlns:core="http://www.mulesoft.org/schema/mule/core" xmlns:http="http://www.mulesoft.org/schema/mule/http" xmlns:scripting="http://www.mulesoft.org/schema/mule/scripting" xmlns:xsi="http://www.w3.org/2001/XMLSchema-instance" version="CE-3.2.1" xsi:schemaLocation="
1. Is it supposed to read the records “one by one” and output them? I was hoping it would create one .xml file with all the data. About 1, not exactly, the transport will create a map with the result of the query and send the map in a message (consisting of column/value pairs), then you can use this map and convert it to an XML file by using the EE transformer Maps-to-xml. Regarding 2, you can use an acknowledgement query to make an update in the table so that the query that you are using does not read the same records again. For example, in your query you can have the condition ‘AND processed = 0’ and in your ack query you can make an update to the processed attribute and set it to 1, so when the query is executed again the record already read will not apply the query. When an inbound SELECT query is invoked by Mule, the ACK statement is invoked for each record returned by the query and typically, the ACK statement is an UPDATE, INSERT, or DELETE. org.xml.sax.SAXParseException: cvc-complex-type.2.4.a: Invalid content was found starting with element ‘jdbc:oracle-data-source’. Could you help me with this error please? Is there a bug or something with datasources in EE? Hi Irasema, thanks for your post. This will work out of the box in the next release wich will be out soon. The workaround for now is to add the JDBC CE namespace to your EE project, that should allow you to use the Oracle datasource. Please let me know if you need more help on this. I couldn’t attach my xml flow, but is almost the same as yours but with an Oracle datasource. Thank you. Thanks for the article Matias. I am trying to read records out of SQL Server and I have a flow very similar to the one you used in the article as an example. The problem I’m having is that Mule reads about 150 records out of 25k records when I go to output the data. I’m using the CE version of Mule. I read on the forums that this might be a memory constraint issue. What’s the best way to get 25k records out from SQL Server using JDBC and then written somewhere else? Hi Ryan, thanks for your post. 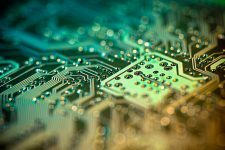 Your are right, there is a memory restriction to handle large database retrievals but it is strange that you only receive a part of the Query result, you should receive a memory exception. Otherwise you should handle it by hand writing some code. I guess I was overwhelming Mongo, so I decided to send the data to JMS first to act as a buffer. Then I can send data to Mongo in a more controlled fashion. As a note writing via JMS handled the query results just fine. Good to know, thanks for posting your resolution. I am trying to use JDBC in Mule Studio EE. but getting error as ‘invalid content was found starting with element ‘jdbc:oracle-data’ I checked http://www.mulesoft.org/jira/browse/STUDIO-1375 but not sure exactly how to implement this. Can some expert please let me know what I need to change in above source to get JDBC working. Hi Sandy, not sure which version of Studio and Mule are you using but that bug is fixed in the latest version and it was a problem with the namespaces. If you were in EE you needed to add the JDBC CE namespace in order to work with specific datasources, in other case you had to use a spring bean but as this is fixed you now should be able to work with datasources in EE without problem. Hi Sandy, sorry about this but it seems to be some issue with the blog system that is not allowing you to paste the code, perhaps to avoid code injection or something like that. Please use a github gist or send us the code to studio-feedback@mulesoft.com and I will check it. Thanks for this clear explanation. I had just one problem. What I get as result is series of .dat files in the output folder. What happens to the resultset after querying the table? Using the community edition, I want to implement the transformers myself. Could you give me some guidelines how to gather those small column messages and send it as a serialized XML message? Hi Sherry, not sure if I understood well but the .dat files are being created because I used a file outbound endpoint and didn’t make much specifications in it but you can take the query result and do what you need. If you want to create a custom transformer you should pick a Script transformer from the palette and that will allow you to write the code for your custom transformer. The query will return you a list of maps (key, values), and the Object to XML transformer will map those values into an XML but will not be able to create the XML structure you want, to do that you can use Datamapper but it will be available in the next Studio EE Version, otherwise you can write your own code to map it, hope this helps you! Thanks for the information. I have coded the JDBCResultset to XML in java. How can I get the resultset from the JDBC end point and pass it to a custom transformer that translates resultset object to a proper XML to be passed to a JMS. The code that i wrote takes the resultset object and then generate XML out of it. That would be good if i could have a guideline on that also. Hi Sherry, sorry for the delay in the answer I’ve been a little busy lately. I think that to adress you problem first thing you need in your flow is a JDBC endpoint with it’s connector and write a query to get the result you want, then you need to put a Custom transformer in which you can make a reference to the class you created, and after the transformer you will need a JMS endpoint with a connector configuration depending on the JMS service that you are using, Something like this should be enough. But it’s pretty similar to the JDBC, you will need to configure and endpoint with the queue, and the connector with the information of your broker. Thanks for your explanation. But could you give more details on how I can get the Hashmaps from JDBC and use that in my custom class. I have seen some custom transformers but not something that works on the Hashmaps and transform that type of data. I need this for my Thesis and can not use datamapper because I should implement this myself. Even i thought maybe you have some sample code for this type of transformers. I am near the deadlines, hope you reply soon. Hi Sherry, if I am getting it well I think the problem is that Mule is returning you a map as a result of the query and you are expecting a JDBCResultset, one of the options I see here is to modify you class to receive the map instead of the JDBCResultset, each record from the query result set is converted into a Map (consisting of column/value pairs). Other possible option, may be faster to try, is go to the JDBC endpoint configuration advanced tab, and look and check the “Disable Transport Transformers” checkbox, this should prevent Mule to realize any transformation over the resultset and return you the object. (List of Maps. Each Map will be converted into a “record” in the XML) I want to see if I have a 5 column table with 100 records, what will be the structure for each record in the table? like what i wrote below? when we query the table with SELECT statement, i think it returns each row separately, it polls the database , right? So I need to gather all those maps in a list and then do the transformation? or I already get the list from the JDBC ? How can I test the what output I get from JDBC? I am getting multiple output files i.e. my sql query should return only 4 records but, the query is getting executed infinite times and my output folder is full of files now. Please suggest how to make the query run only one time. Also it shud generate an XML file but it generates .dat i.e. flat file . Why ? My company is evaluation Mule ESB and Mule Studio, but we are a .NET development house, and some of the intricacies of Java elude us. Can you create a BLOG for using Mule ESB, with Mule Studio and connecting to a MS SQL Server? Hi Joe, there shouldn’t be much difference between this blog wich uses MySQL and using an SQL server, the main difference will be that you will need to import the jar driver of the SQL Server and then create an Spring Bean to use as a Datasource, in the bean you have to specify the Driver Class name and other values as the URL, User, Password. Is it possible to capture the return value from a stored procedure? I can see we can use output parameters but just thinking about calling existing stored procs that may return an error status. To do that you need to define output parameters in your stored procedure or in other case execute a SELECT after executing your stored procedure to retrieve the information you may need. Hi rayan does MULE support 4GL Database.. is ther any options for it!! 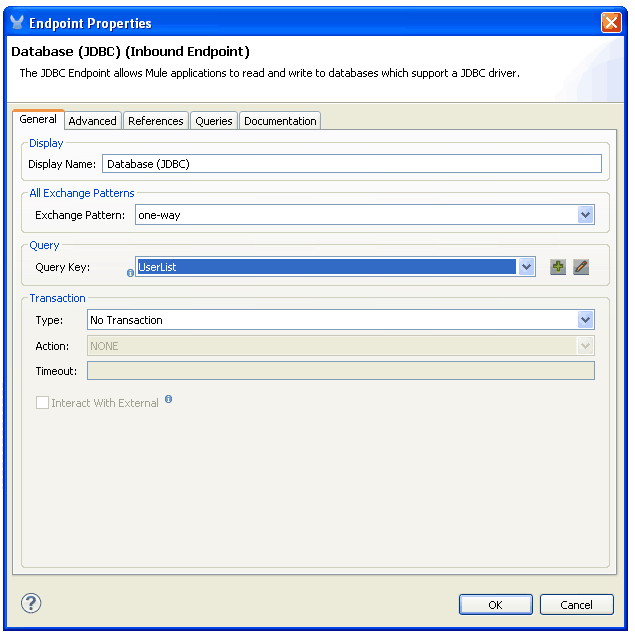 The RETURNING statement is not still supported by the JDBC Connector provided by the ESB but it is supported by the JDBC Driver, you can create a Java Component to execute the query using the RETURNING statement instead of using the JDBC endpoint or other way would be to add a second JDBC endpoint to execute a query to get the last id. If you are using the Community version and you are experienced with Java you can also contribute to the JDBC connector to add the support. Could you expand on how to use a Java Component to execute custom queries? 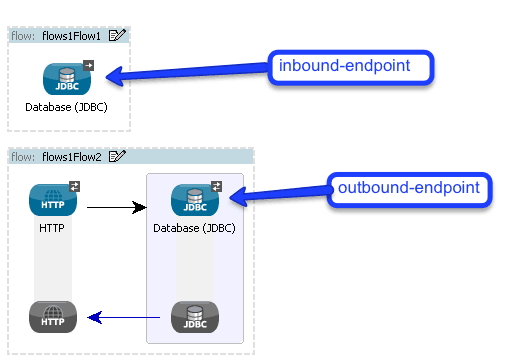 “[…] or other way would be to add a second JDBC endpoint to execute a query to get the last id”. In a high concurrency environment you may have several other inserts with the stored procedure before the second JDBC endpoint executes and you get a wrong last insered id back. This is a task for a stored procedure with a transaction. And because of the lack of the feature to return data from a stored procedure in the community edition of Mule this is an impossible task. Do you know how to get the JDBC Driver (the configured database connector) within a custom component to execute the stored procedure by myself to get the result of it back? Can I get user and password for Global CMIS configuration information by database and not by properties file? Hi Ecos, yes you can, I really haven’t done this by myself but, as far as I know, you need to use Spring DataBase properties placeholders. the eeJDBCconnector just never call the overriden code. Can someone give me some advice. Where I can find the source code of eeJDBCConnector? Hi Tommy, if you are using our EE version I believe you should be able to contact our support team, they will be able to give you a better and faster answer for this. 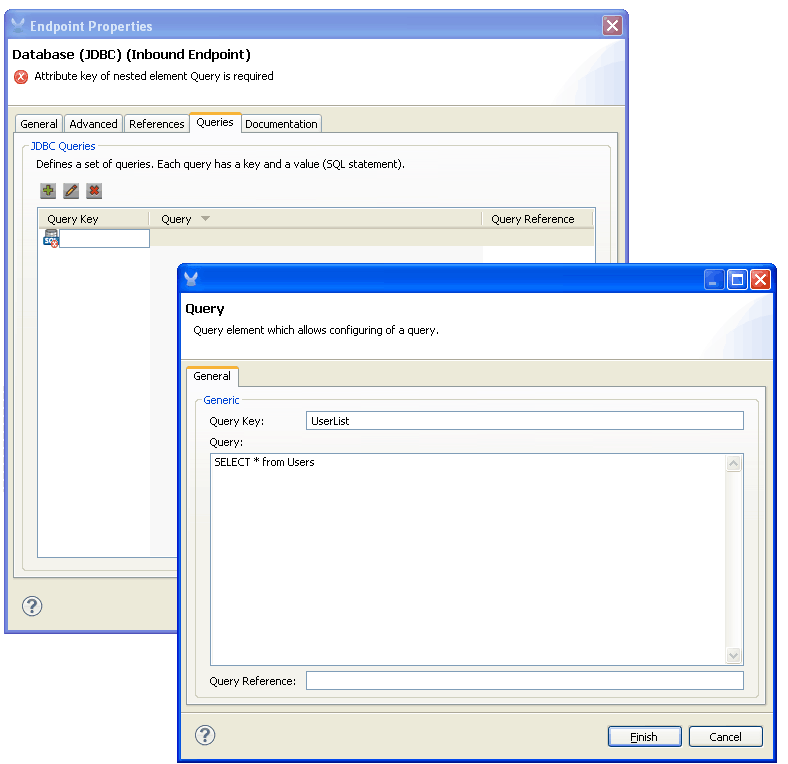 I use Mule Studio Version 3.3 with an Oracle database connection. My problem is: I execute a SQL-SELECT-Statement with a database connector and get the result as the message payload, but I need the results columns and values as (session-) variables instead of overriding my payload. Nice post indeed. Very helpful. I have a small question, do have any idea how we can create database connection (MySql) and fetch data inside mule script using groovy? If yes, could u please share a sample code to do that. I’ve recently started working with Mule. Can you help me about how I can define tables in database and read/write data into it? Thank you for the post. When I use global end points, can I avoid saving databae password in clear text in the final Mule XML file? This is mandated for audit reasons. Is there a simpler way to dynamically set jdbc connection properties esp when i move from one database instance to another during development cycle? Hi Balajee, yes you can do that by using Properties Placeholder and the mechanisms provided by Spring which let’s you use encrypted properties. And when developing you can create different properties placeholders files for different environments. Is not a very short topic to summarise it here so I’d suggest you to google for more info around those Spring features. Hi, thanks a lot for the feedback, I really want to write a new one and more updated blog around this topic 🙂 I just need to find some time. I need a mule example to pull data from db to flat file. Would you suggest me any link please?? 1) After running the example, .dat files are getting generated with some random name. How can I give my custom name with extension. 2) Series of .dat files are getting generated. How to stop that? Please resolve my queries at the earliest. 1) You can use the outputPattern property in the File endpoint in order to set the names of the files, and you can use MEL expressions (Mule Expression Language) in here. I configured as400 bean and database to use it as a datasource. I added external archive as well. When I run test within the studio it runs fine, successful. But when I start the project, it gives me an error No suitable driver found for jdbc:as400…. What could be the problem? Thank you! Hi Arkadiy, what version of Studio are you using? it is odd as Studio build the same classpath. What you can check is this, run your application, and go to the workspace directory. There you should have a .mule folder and inside the apps folder where your application is deployed. There you can check that the jar is present in the project structure. What is the default return type if no match or results are fetched from a database select query in Mule 4. Is it blank, empty array or null payload?